I love your articles. I love the concept of letting your little ones just be alone sometimes. I feel I am constantly trying to entertain my little 5 month old girl, and I want her to be someone that likes her own company in the future and can be creative by herself. I don’t know if my LO is clingy (maybe I’m misunderstanding something) or just used to me being right next to her 24/7? For the last 2 months I have been trying to let her have as much floor play as possible (I hid away the big box of toys, musical swing, and she hardly ever goes in a buggy or car seat) and just gave her space and a few open-ended objects to play with. I stay in the room with her so I am within reach but try to let her have her own space. She seems to get very frustrated and complains a lot after a short amount of time. If I go over to her and engage with her, she is instantly happy. I have not been denying her cuddles or interaction, but she seems much happier when I’m constantly entertaining her with singing, faces etc. Maybe I’m getting something wrong? Please help! The only other thing I can think of is that she doesn’t want to be restricted on the floor. She LOVES to be held up on her legs in standing position. She complains at tummy time and rolls but isn’t crawling yet, and just seems to want to stand (with my assistance) for a large amount of time. 1. Sit on the floor holding your baby on your lap in a horizontal position, if she’ll allow you to. Sometimes when babies are accustomed to being in an upright position in our arms, they won’t stand for being held another way. If that’s the case, hold her at more of an upright angle on your lap. Relax and let her look around. Place a few interesting, but simple play objects out on the floor beforehand so that she can see them. Don’t point the toys out to her or try to coax her into going there. Just be patient, quiet and accepting. Let her feel settled and see what she sees. 2. When you feel she’s ready (perhaps she’s leaning towards the floor or seems interested in the toys), tell her that you will lay her down, and then place her on her back. Stay right there, so she’s very close to you. Don’t pick up the toys, move them closer or put them in her hands. Just wait and see, let her “be”. If you are impatient, tense or have an agenda, your daughter will probably sense it. So, work on totally letting go and just observing. Remember that complaining about trying something new doesn’t mean she’s “unhappy”. 5. Most babies do love it when we stand them up, move them around, show them toys and otherwise entertain them. What’s not to love? When these ways of interacting become the norm, they are desired and expected. This wish to repeat the familiar can become a distraction that makes it difficult for the child to engage in the slower paced, self-created and self-designed activities that are profoundly beneficial and vital to learning. It isn’t that your baby feels “restricted” playing on the floor; it’s just that it is such a new and foreign idea to her. (In fact, she is far more restricted and dependent when you are holding her up). And she may not yet believe that she has your attention when you are quieter and more passive, so you’ll have to prove it. The key is to gently wean your baby from expecting entertainment while providing her the trust, space and time to create her own. A baby who can self-entertain will never need TV. 6. Just as it’s up to us to instill the habit of self-directed play (which most babies end up loving even more than the adult generated kind), it’s also our job to ensure that our babies are developing motor skills organically, if that is something we value. Although both are innate desires, we have to pave the way (which usually means staying out of the way). If this is the direction you want to take, I would recommend that you not hold your baby up to stand anymore, ever, because that is interfering with both inner-directed play and natural motor development. If she seems to want you to do it, I would acknowledge honestly, “I see you are asking me to hold you up. Yes, we used to do that, but now we’re going to wait for you to be ready to do it on your own. That will be healthier for your body” (or something like that). 7. It isn’t surprising that interaction with her beloved mommy makes your daughter “instantly happy”. Continue to engage her with your joyful attention when you two are feeding, bathing and diapering, etc. Sing, make faces and share jokes while you “work” together. These loving interactions combined with child-led playtime in which you are an appreciative audience to your baby’s ever evolving antics will provide her the absolute best of both worlds. For inspiration and further clarification, here’s an enchanting, brief montage of a baby’s first 5 months of independent play, generously provided by Kerry (a fellow New Zealander, Jade!) Note the minimal toys needed, the time baby Kobe spends exploring his hands, moving his limbs, pondering who knows what? Notice the comfort he seems to feel in his own skin and the way he achieves “tummy time” gracefully and confidently. Kerry is an early childhood teacher in New Zealand and began working in a nursery 2 years ago which sparked her passion for respectful care and Magda Gerber’s RIE approach. Since having Kobe 6 months ago she has been privileged to put into practice all she’s learnt and is amazed everyday at Kobe’s attentiveness, confidence and grace. SO happy to see a detailed article about this. Thank you!! Are there any differences I should make for twins? You’re welcome, Darcie! Twins are a big plus when it comes to independent play because they each have another fascinating baby to interact with and learn from. Yes, I would follow the same guidelines…acknowledging communication, giving breaks when needed, paying undivided attention when you can. You’ll be a bit busier, obviously. Congratulations! I just wanted to say thank you so very much for all your wisdom. Our little daughter is nearly 8 months old now and all you have taught me about RIE has had such an amazing effect on our family and on little Sarah. She is independent, happy and calm. She plays by herself with very little need for adult ‘help’. She is content to explore her own self or something as simple as a seashell over any plastic toy you could give her. I really can’t thank you enough. You have taught me so very much about letting my children grow naturally. I’ve been reading your website for a year or so and really love your articles about toddlers – I have a three year old. I feel so guilty when I read posts like this one because I spent my son’s babyhood entertaining him – I thought constantly interacting with him was the right, loving thing to do at the time. I wish I could go back and redo… Now he’s three and does not like to entertain himself at home without one of us playing with him. We try to encourage solo play, but he often gets upset in reaction to that and finds ways to get our attention if we turn it away from him. Encouraging him to play by himself end up coming across to him as a sort of “punishment”, if that makes sense. The times he does play alone are always random, 5-15 min. at a time when we’re busy with something else and we haven’t said anything to encourage it. So we wind up letting him watch a little TV or play iPad apps so we can get some of our own space/a break. I’m not sure what to do at this point to encourage solo play. He’s very social and outgoing and I wonder if his personality is such that he will just always enjoy playing with someone to playing by himself. I just feel like something’s wrong that he can’t entertain himself for very long and I feel so bad about it. Your son’s social and outgoing nature is wonderful and is definitely a piece of this puzzle, too. So, please don’t blame yourself! This is a small, unimportant issue compared to so many others. I just have to say take Janet’s suggestions – it works. I have a business i run from home and I didn’t need babysitting until my son was two and a half because he would play alone for hours either by my desk or in his room. At 2 1/2 he wanted more social interaction and thus prepared him for preschool. Just yesterday at 3 1/2 he played alone in his room for almost 2 hours, perfectly content – which is unheard of with my non-RIE friends. I have a question. My baby girl loves to lie on her back and play. She’s four months old now and is often happy to lie and kick her legs, squeal, hold her toes, study her hands etc. I have not done any tummy time with her as both RIE and my Feldenkrais training have inspired me to let her find this herself so that her back muscles are truly ready to support her head in a functional way. However, lately I notice a small flat spot at the back of her head. I had thought that since she is so active on her back that this wouldn’t be a problem. But now I’m kind of worried. So much so that the last couple of days I’m not lying her down much (holding her a lot which of course isn’t sustainable) and I even tried putting her on her belly to see what she would do. She held her head up well for a short while and even let out a squeal of delight. I think the new perspective was funny for her. But pretty quickly she put her face in the floor and started crying. She has spent no time in seats or even a stroller as I prefer a carrier to a stroller, so those things which were what I had assumed were more responsible for head flattening are not a possible cause. I’m not sure what to do here. I’ve made an appointment with the osteopath to have a look and a feel. I could be overreacting so I want her opinion. I’m a little nervous that she won’t understand my reasons for not doing adult imposed tummy time but oh well. I’d love to hear your thoughts on this. Were you already doing RIE when your children were this age? Have you seen any children develop any flat spots due to lying on their backs? Is it possible that it’s something that will resolve on it’s own? I took S to the osteopath today and she told me that the small flat area has nothing to do with being on her back and that it is normal cranial development at this point. Hurray! I also got in touch with other people I know through the Feldenkrais community and asked them what they did with their children and they all waited until their child was able to roll to their tummy themselves and never noticed any issues with the shape of their head. Elanne, thanks for this update. This is great news! I don’t claim to be an expert on plagiocephaly (flat-headedness) but there is research from the Pikler Institute about the orphan infants raised there. All were allowed free movement beginning on their backs and none were placed in “tummy time” until they could roll into that position themselves. There were no cases of flat-headedness in 50 + years. Hi, I had this with my second child. He had a flat spot on one side of his head. This developed as he favoured one side to sleep and I wasnt quick enough to take him to the osteo (I waited 4 weeks). I was nervous about not doing tummy time as everyone recommended it to help his head. I followed the RIE method for my first child and her movement and strength made me really want this for my son as well. My instinct told me that probably most growing occurs when babies sleep so him being on his back on the floor while having play time wasnt going to make the flat spot worse. I compromised by using a safety sleep wrap to help with positioning during day naps, took him to the osteo weekly, limited car seat/pram time, and then relaxed about him lying on the floor as per the RIE method/play movement times. His head isnt perfect at 6mths but unless you were looking for it you cant see a flat spot, he is now almost nearly always on his tummy having found how to roll himself. I just wanted to comment as flat spots can cause high levels of anxiety so I hope my experience may be of help to anyone wondering if they can still follow rie method in this circumstance. The other thing that is really important is when back sleeping check they are comfortable with turning their head to either side and if not take them to see a osteo/physical therapist who specialises in in babies straight away as they will need help with their neck muscles. I’ve been exploring your blog and love it! Thank you. Our second son is almost four months old and I am trying to encourage more independent play as you describe above, but in a spirited 2 year old big brother, it’s hard to find the time and space for truly “uninterrupted” play time. Sometimes big brother seems like great entertainment, like a mobile I suppose! Do you have any suggestions for this situation? Also, do you recommend a certain amount of time for this kind of play to begin with for those beginning to try this approach? Hi Frayda! Brothers will interrupt and that’s not such a bad thing. I recommend giving the baby his own separate play area, if at all possible. That way his brother can have his toys “protected” and the baby can be totally safe. Big brother could be allowed to join the baby if he wishes. I’m joining the chorus here with the fantastic website & for the first time ever am posting a reply to a blog, sincerely hoping that you will input as you have with so many others. My 7.5 month old son Sebastian sounds very much like Jades 5 month old. Unfortunately, I laid my baby in a baby chair from about 6 weeks old, rather than a tile floor thinking I was doing the right thing. We started swimming at 8 weeks old and have been doing Pekip gym classes. He is a big breastfed boy with enormous strength and just loves to be on his feet. When we offer our hands, he just pulls himself right up to either sitting or standing. He is a very stable sitter. With fabulous balance and from that position will lean forward onto his hands and knees but isn’t yet crawling. He will also pull up on tables and his cot bars, but the problem is he cannot get from lying down to sitting. I am very keen to get on board the RIE boat as it makes so much sense, but I’m unsure if we should go back to lying down and talking him through working out how to sit up or just let him get on with it. We also need very much to work om his development of uninterrupted play as we luckily in some ways have full time helpers and he is never left alone – so has grown used to being entertained. Consequently he shouts if left alone longer than 5 minutes. In a nutshell, I’d love your advice on where to start, and to clarify if it’s too late to start on independent gross motor skill learning, and how to encourage his independent play. I’ve ordered a few books online, but they won’t arrive here in hong kong for a month and we are already trying to start with more and better communication and testing the waters with not putting him into sitting position. Hi Caroline! I would go with “go back to lying down and talking him through..” But there is no need to talk to him about sitting up. The most important part of this transition is trust in your boy to figure these movements out when he is ready. Babies are extremely adaptable and it’s never too late. Key ingredients are our commitment and a calm, confident attitude. Please give me an update if you try this! This is a great article; thank you for sharing it. My 4.5 month old has recently become extremely fussy since learning how to roll over onto her tummy. Everytime I lay her down to play, she rolls herself over onto her tummy and then starts to cry, in what seems like frustration. She frantically kicks her legs as if she is trying to crawl. I give her some time, and then come over to ask if she wants a “break”, then roll her back over. At that point she usually starts to scream and cry. I have tried leaving her alone, picking her up, sitting her up, etc. and nothing seems to help. I have even propped toys next to her so that it inhibits her ability to roll over, so that she will have a break and just play on her back. She used to be a pretty relaxed and calm baby, but now it seems the older she gets the fussier she is becoming. Please help! I agree with Trish! I have a 20 month old and he will do independent play for about 30 minutes if it is something VERY interesting and usually a bit new. How can I teach him to play more independently for a longer period of time? I had used the RIE principles with my daughter now 3 and now I have a 6 month old also. My oldest is pretty good at solo play, she can spend a long time plying on her own somedays and others wants me more. I’m happy with this it’s just when I try to give my son attention at feeding times/ bath times ( we all bath together) and changing times my daughter seems to want my attention these times and will tantrum if I don’t interact with her too, which spoils the nice moments for me and Kade! consequently my son will play by himself for a little while but complains pretty quickly when left on the floor, sometimes I leave him to see if it’s just frustration and he winds up to full blown crying. I also find it hard to spend observing time with him much as there is so much to do around the house with 2 kids! Cleaning/ making food/ cleaning up again/ washing helping my daughter open things or find things for her play etc etc usual household stuff, I end up carrying my son around to keep him happy while doing jobs with one hand! Any advice? I wouldn’t worry about the baby not playing as well independently right now. Yes, life is busier than it was when you only had one (and it was busy then, too!). Your boy was born into a different situation and will have a different experience, Just do your best to give them each some one-on-one time. Janet, as always I love your posts. 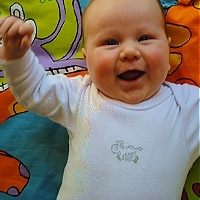 My 4 month old (Michaela) is doing well with independent play thanks to your instruction – thanks so much. She is rolling easily onto her tummy and plays there for sometime but eventually it seems she get tired of being on her tummy and has not yet learned how to roll back onto her back. She starts sought of grunting and making a fuss but I wait until she’s crying in case she’s just making noises out of determination/frustration about the toys she is reaching for. Is it ok for me to help her roll back or is it better for me to let her know I’m going to pick her up and do that? Also, a bit off topic but my 2.5 year old (Charlotte) sometimes becomes a bit rough with the baby and tries to pick her up and make her stand (she wanted her to play a jumping game with her). When she does this I kind of jump in saying “no! no!” at which point Charlotte gets frustrated and starts hitting the baby. We put the baby in a safe play area for a while until Charlotte calms down but she gets even angrier as she sees the baby gets to go somewhere special. We talk to her about hitting pillows and stamping her feet when she’s angry but I’m not sure it’s getting through. Hi Janet! Just discovered RIE through your website recently. I’m having the same issue with my 2 1/2 months daughter. This was very helpful, though I do have one question… How can I know if she’s telling me yes or no? Specially in the middle of crying. Hi Helena! If her crying continues or escalates, I would consider it a yes. I wanted to say the following regarding the flat head question where you mentioned the orphan study (which no flat head’s were reported). You did not mention the numerous studies that show that since babies have been placed on their back to sleep (and not on their tummy) that flat headedness has dramatically increased! Also, I will take aspects of this article into consideration, however I think it is silly to think that entertaining your baby is going to lead to less creativity. It is wrong to leave a baby laying by themselves until they are able to play more independently. A study was done showing that it is likely the more things we experience, observe, and touch as babies actually leads to a larger brain and higher IQ. I think we need balance. What I don’t think we need is our babies lying by themselves on the floor for the first half year of their existence. Plus, babies under six months do not understand complex sentence structures. Therefore saying to your baby (quote) “I see you are asking me to hold you up. Yes, we used to do that, but now we’re going to wait for you to be ready to do it on your own. That will be healthier for your body” … is complete hogwash. Your baby will only understand that mommy or daddy is not going to interact with me as much as I like. They may understand your tone of voice, but not this phrase! Babies stop complaining over time when they realize that their complaints get no results. Therefore you may see a relatively quiet, peaceful looking baby lying on the floor, but that doesn’t mean they are content. Would you like to share where you get your information, Danielle? Mine comes from infant specialists and pediatricians who have collectively observed the development of many thousands of infants. And the information they’ve gathered has been corroborated for me by my own observations of infants in the classes I’ve faciliated for the last 20 years. 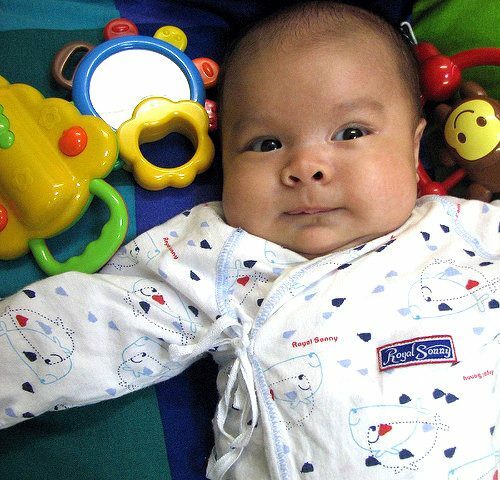 Researchers are also finally noting what Gerber and Pikler have know for many years — infants and toddlers are incredibly able, active learners, even while it may look to some as if they are “just lying there”. If you don’t find the advice I offer agreeable, please feel free not to take it! Thank you! I was about to write in with the EXACT same question…my daughter is 5.5 months and I’ve working to make this transition also. Very helpful!! My daughter is almost 5 months old. I do nothing but hold an entertain all day. No joke. I have older children and I feel like I’m neglecting them. We lost a little boy before her so we all coddle her way too much. We know it but it’s hard not to do! How much floor time did you give Kobe per day? He looks very happy and loved! I’d like to do this if I can! hi Janet, My baby is 5 months old now. May I know if he keeps crying when lying on the floor after sometimes, can i pick him up? is he bored with the toys or tired? thank you. Probably tired, Diana, but regardless, I would definitely ask to pick him up if he’s crying! Janet, thank you for your replies! he normally will cry after lying on floor about 10-15minutes. Do you mean i should ask, do you need me to pick up (when he is crying)? Thank you. I have another question. I realised my baby will play longer by himself when i am sitting near to him. when i walk away, his eyes will look for me and after a while start to ‘complain’, do i need to constantly sitting beside him, or do you have any suggestion on how to wean baby to totally play by his own without any companion? Thank you. I’m not sure how old this thread is, but I’ve been scouring your blog for the answer to this as well. My baby is 6.5 months, and is great playing independently while I am there to observe (and when she’s gotten enough sleep), but will not let me leave her without high-pitched screaming. Despite being in RIE play classes, I find that I’m carrying her around at home all day because she is so visibly upset when I leave her to play on her own. Is there a way to transition over time to help her be able to spend time in her yes space without me in the room? Thanks! This seems to apply more to younger babies…what if I have a walking one year old…how can I help them become more self-directed if up until this point they have been entertained by a caregiver or us? Janet, this is fantastic. Thank you so much. A real, detailed answer to a question most of us can have. I am currently at home with my 2 years old big boy and my little 3 months baby girl. Sometimes it’s not easy, but I know the time will bring other challenges and new experiences, and this happens at each age. Thanks again! Looking forward to reading your book. Kind regards from Munich, and a warm Christmas time for all. My tamariki are all grown up now but when they were babies I would lie down with them when they had tummy time so they felt my presence. I found this helped them get used to the idea and it also gave me the insight of how it feels to be at this level. What made it comfortable, or made it feel overwhelming. I really enjoyed reading this. I have a 7 month old and a 3 year old. I’m somewhat new to practicing RIE. These all seem like great ideas, but how can they be realistically implemented with another child around? For example, my 3 year old will constantly try to roll the baby over or when he’s sitting, will push him over. He shoves toys in his face and rips other right out of his mouth. My baby seems to tense up whenever his brother comes around and wants to be held (probably to escape). I’ve been trying so hard to teach my 3 year old how to interact with his brother, but it’s not improving. Any advice and examples on what I can say and do would be appreciated. I was wondering how to acheive self directed play as well as not holding baby in positions like sitting up or standing etc when other family members dont value this and arnt interested in readings. I dont want to tell people how to engage with my child as i beleive their relationship is not really my budiness but I do feel anxious when they interact with bubs in an overstimulating adult led manner as this is the opposit from the way I value. Any tips or advice would be appreciated. Hi there! I’m recently learning about RIE and reading through your articles! I really like this article and will foster thus independent play with my 6 month old. But I really need help getting my 4 year old to play independently. I’ve read through the responses here and have seen your replies and links to other articles, but they’re for toddlers and older babies. Help! She can not, will not play independently. She always needs someone there, even just to watch her play. It’s exhausting. I would love to translate your articles into german language and assist in publishing and spread these wonderful information for german speaking parents. Did you ever think about that and does it fit to your vision? I´m an acknowledged Piklereducator (I leaned over years with Anna Tardos in Budapest) working since 20 years with parents and educators. I started just 2 years ago to bring this treasure into internet through my book “Hurra, ich spiele!” sold by Amazon and through two video-courses about free movement and play for parents, that are sold by my collegue Evelyn Podubrin from “Kinder in Bewegung” online-congress. To give you an impression about my attitude and work, I could send you my book about Play in english in the form of pdf. Its not published yet. I´m not sure if and which way of support would be useful for you, but I just feel, that I like your style so much and feel so connected with it, that I really would do my best to spread your texts into the german speaking countries and find a way to work together. I´m open phone or skype (luciegraebe) at any time with you, if you wish and on the other hand I don´t want to get on your nerves in case you are too busy and don´t want to spend time to my dream, if it doesn´t fit with yours or with your marketing strategy. Have a good start into 2018 and lots of acknowledgement from my side! I love reading your articles! Many aspects of the RIE approach really speak to me. I recently had my first child. He’s almost 3 weeks old. When is an appropriate age to start encouraging independent play? Is this too early? And how long should I expect him to play independently? Hi Janet, thank you for this article. I have a 5 month old who is incredibly vocal and we had gotten to a difficult position where she would cry every time we lay her down to play. I popped to the shops for a couple of hours and when I got home, my husband joyfully told me that he had figured it out, she just wants us to carry her around all day. My husband said this from a position of love but I felt that it really was not the answer, I knew that my daughter was bright and desperate to learn so I came in search of an article to help, 3 days after reading your article, she learnt to roll over by herself. The problem I have is just how vocal she is. I cannot work out how often I should talk to her, when it is appropriate to pick her up and what I should do when she cries and doesn’t want to go back on the floor. Some times she makes some form of noise for the entire time she is awake, all day. Should I constantly be talking to her, is she constantly trying to tell me she is unhappy (I’d often describe it as whining, not crying) or should I ignore some of it? Thank you for your articles, I have also read one of your books but am struggling to understand what to do in these situations. I could use some advice on steps to wean my 11 mo old from the constant neediness I’ve created. She doesn’t crawl, hates tummy time and cries when I put her on her tummy. She can’t get herself to a sitting position, but can sit unassisted. She can almost walk; if I let her hold my finger she will run me till I collapse! How can I step back and let her develop crawling skills “organically” without shocking her system? I think it might be easier to begin self directed play if she was independently mobile! I don’t have this one transcripted as yet, but hopefully you can take a moment to listen. You can do this!